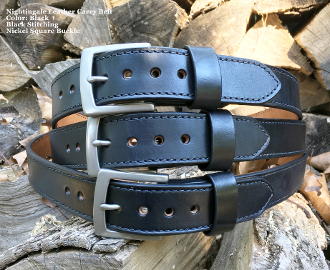 Beautifully finished belt for dress or casual wear. Constructed of two layers of American premium Hermann Oak leather, bonded and single stitched together. This 1.5" belt is the perfect width to carry even the heaviest of handguns. Black, Brown, Cordovan, Mahogany and Natural colors available. Square or rounded buckle in solid brass or solid brass nickel plate are available. Optional Black Shark, Black Elephant, Nicotine Brown Elephant trim available. The trim piece is a 10-12" piece of exotic hide on the front of the belt. Take a cloth measuring tape. Put it through the belt loops on your pants. Note the measurement to the nearest inch. The belt that we make for you will be sized to the measurement that you submit from the tip of the buckle to the center fit hole. You can also measure using a belt you currently use now. Measure from the far end of the buckle to the hole you use most often. This measurement may be larger than you think your waist is. Typically it is 3-5 inches. Also, do not measure a belt that has stretched out. We need to know your actual circumference. If you plan on carying IWB (Inside the Waistband) I would recommend you add a minimum of 1-2" to the belt length to accommodate the extra thickness of the IWB holster and firearm. All too often, we have returns due to a customer measuring there waist incorrectly or going by the size of their pants. Accordingly, Nightingale Leather will no longer accept returns on any belts. So please measure your waist correctly. Just a note, the belt will be slightly stiff when you receive it. This is normal. It can take up to a few weeks to a few months of everyday wear to break your belt in. Once it is broken in, you will appreciate the quality and detail of our Nightingale Leather belts.